Bruce is a cute little turtle who loves cabbage. One day, he knocks his cabbage off a cliff. What to do? 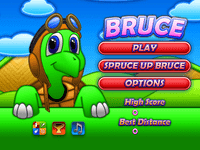 But Bruce is a brave turtle, and so he leaps over the side of the cliff and plummets, harvesting as many cabbages as he can.